PreS-Gr 2-In this fine translation of Cole's Truelove (London, Jonathan Cape Ltd., 2001), a family pet is displaced by the arrival of a new baby. 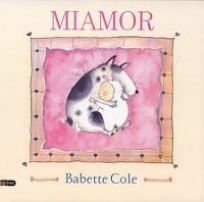 The situation is fully framed from the pet's point of view on the first page: ""Now that they have a baby, they don't love me anymore."" The book goes on to offer many different ideas of what love is. The hackneyed sentiments of the text are more than offset by the hilarious illustrations. Readers follow the peculiar-looking dog through many wacky misadventures as he runs away from home and joins a gang of hooligan mutts. All is well in the end when his family finds him and brings him home (along with all of his disreputable new friends). The appealing watercolor illustrations are done with tremendous humor. Recommended for public libraries and bookstores. M.O.B.